SEOUL, South Korea (CNN) - North Korea is willing to talk to the United States about giving up its nuclear weapons, South Korea said Tuesday, in a remarkable development that followed unprecedented meetings in Pyongyang. North Korean leader Kim Jong Un also has agreed to refrain from conducting nuclear and missile tests while engaging in dialogue with South Korea, Seoul's national security chief Chung Eui-yong said after returning from talks with Kim. Chung said Pyongyang expressed willingness to talk to the United States "in an open-ended dialogue to discuss the issue of denuclearization and to normalize relations with North Korea." North Korea clarified that it had no reason to retain nuclear weapons if "the military threat to North Korea is resolved" and the country's security can be guaranteed, Chung said. It's a startling statement from a nation that only months ago declared it could wipe the United States off the face of the Earth and comes just hours after the five top South Korean government officials spoke with the young North Korean leader. Monday's meeting is believed to be the first time Kim has ever talked face-to-face with any officials from Seoul since taking power in 2011. An official with deep knowledge of North Korea said Kim wants the world to know he has a strategy and "he's the sheriff in town" who sets the rules for his government's interests. US President Donald Trump said he believes North Korea is "sincere" in its peace talks with South Korea. The US will move forward on joint military exercises with South Korea, an administration official said. South Korean President Moon Jae-in and Kim will meet for a summit at the demilitarized zone that divides the two Koreas in April, Chung said The two sides will open a hotline so the leaders could communicate directly with each other, according to Chung. President Trump said he believes North Korea is being sincere in its attempts to broker peace with its neighbor. "I really believe they are sincere. I hope they are sincere. We'll find out," the President said. Trump attributed the recent momentum toward talks to strict new sanctions applied by the United States. The US is looking for North Korea to take concrete actions or "credible moves" toward denuclearization before agreeing to direct talks, a senior administration official said. "All options are on the table and our posture toward the regime will not change until we see credible moves toward denuclearization," the official said. The official indicated a North Korean pledge to stop testing nuclear weapons and ballistic missiles would not suffice if North Korea privately continues to develop its nuclear and ballistic missile programs. The US and South Korea expect to go forward with their joint military exercises, a senior administration official said. The Trump administration has often said it's willing to negotiate with North Korea if it puts denuclearization on the table. "The fixed policy of the United States of America is that we are going to continue with all options on the table to bring intensifying economic and diplomatic pressure to bear until North Korea, once and for all, completely and verifiably abandons its nuclear weapons and ballistic missile program," Vice President Mike Pence said last month after visiting South Korea. Chung will head to the United States later this week to brief his American counterparts on his meeting in Pyongyang, a spokesman for Moon's office said. The announcement represents a significant diplomatic accomplishment for Moon, who used the Winter Olympic Games to engineer a thaw in relations with the North that had previously seemed a distant prospect following a string of North Korean weapons tests and rhetoric from Trump and Kim. Moon, who was elected last year after his conservative predecessor was ousted in a corruption scandal, has been proponent of dialogue and engagement with North Korea since his days as a presidential aide to the former President Roh Moo-hyun. 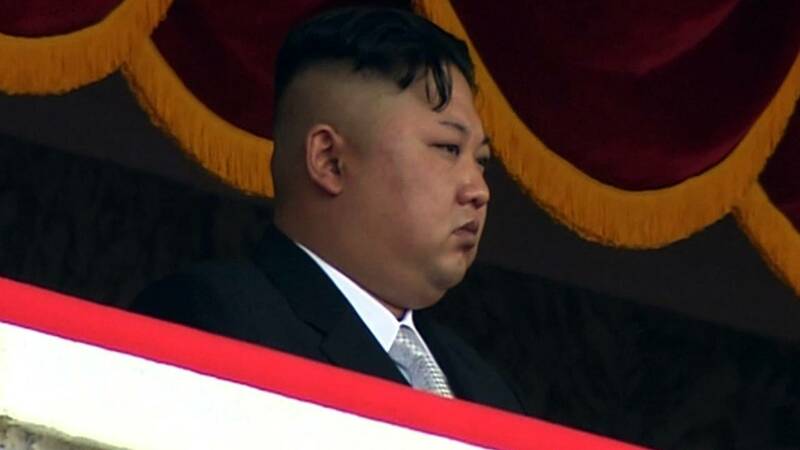 He's since had difficult job of playing interlocutor between a North Korean regime that last year appeared determined to advance its nuclear weapons program and an administration in Washington that believes Pyongyang's development of a long-range ballistic missile potentially capable of hitting the US homeland with a nuclear warhead constitutes an unacceptable risk. But the detente brought about by the Olympic diplomacy offered Moon an opportunity to dispatch Chung and four other top government officials, including South Korean spy chief Suh Hoon, to Pyongyang, where they met with Kim and some of his top aides, including his sister, Kim Yo Jong. Suh's inclusion in the South Korean delegation kicked off speculation that the two sides were planning another summit, as he was a key figure who helped organize the first two inter-Korean summits in the 2000s. The April summit will take place at Panmunjom Peace House on the South Korean side of the demilitarized zone that divides the two countries, according to Chung. The last inter-Korean summit was in 2007, when South Korean President Roh met Kim's father, late North Korean leader Kim Jong Il. Though surprising, the statements from North Korea aren't a complete U-turn. Pyongyang has long maintained its development of nuclear weapons is a response to what it calls the US "hostile policy" toward the Democratic People's Republic of Korea, as the country is officially known. "To some extent, this is a reiteration of something the North Koreans have said, that Kim Jong Un has said. But context and timing matters, and this opens up the opportunity for more diplomacy," said John Delury, a professor at Yonsei University's Graduate School of International Relations in Seoul. A top North Korean diplomat at the United Nations said in October his country would not put nuclear weapons on the negotiating table "unless the hostile policy and the nuclear threat of the US is thoroughly eradicated." Duyeon Kim, a senior research fellow at the Korean Peninsula Future Forum in Seoul, told CNN it was now up to negotiators to seize on the opportunity presented by the summit and potential talks with the US. "Pyongyang's intention to denuclearize and refrain from testing during talks simply reiterates its longstanding position in principle, (they) are conditional statements and dubious, but saying them publicly nevertheless give Washington and Seoul something to work with. That's where good negotiations come in," she said in an email. The US and South Korea had postponed joint military exercises, which Pyongyang views as hostile, during the Winter Olympics but the drills had been expected to resume after the Paralympics end later this month. It's not clear whether Tuesday's developments will alter that. During his Tuesday meeting, Kim told the South Korean delegation he "understands" Seoul's position on the drills. "Our stance on the joint military drills is that it is hard to postpone the exercises again or suspend them and there is no justification for doing so. But Kim said that he understands the South's stance," an official in President Moon's administration said.